20 February: Updated the rankings & did some site maintenance / more? To escape the blistering cold of Neopia in Winter, you run to the nearest skyscraper. As you enter the air-conditioned lobby of what you now recognise as Echelon, you spot a striking faerie sitting behind a welcoming desk. You hesitantly approach what you assume to be Echelon's receptionist. Welcome to Echelon's Headquarters! I'm Caitlin and here we rank only the highest-quality sites for all Neopians to enjoy. Feel free to navigate our headquarters as you please. Established on October 1st, 2011, we have three main rooms available to the public. The first of which is our Grand Rankings Museum. It is the central and largest room of the headquarters. The second room is our sweeping Extraneous Library, which has two small rooms that lead off of it: the Hall of Fame and the Honourable Mentions room. The Extraneous Library also contains many documents that may be of interest to you on its shelves, including the story of Echelon's founding and naming and a scroll on ranking criteria. And last but not least, we have a Site Room, dedicated to all of our wonderful affiliates and supporters. Please don't hesitate to contact me if you have any feedback, questions or suggestions. We hope you enjoy your visit to Echelon! Reminder: I have been crazy busy with University and work so updates are made fortnightly or whenever the need arises. I always keep an eye on the site community and make little changes if necessary. I just haven't had the time to list by category the ranking changes. I have updated the general rankings and the achievements page to reflect changes in rankings :) As always, if you have any suggestions or questions about the rankings or the site in general, please feel free to submit/ask them via neomail! Welcome to Echelon's Grand Rankings Museum! Here we've ranked the highest-quality establishments for you to easily peruse, admire and visit. Our mission at Echelon is to recognise the site-community's most elite. Extra details or important statuses for relevant sites are engraved on the site badges if you hover over them. We hope you enjoy your visit! If you've been ranked in the museum, congatulations! The Commander passes on his accolades. Perhaps you'll get the opportunity to meet him some day. In the meantime, on behalf of all of Echelon, we'd like to bestow you with a medal of honour which symbolically recognises your site's achievements! The Expanded Calendar is a helpful guide to Neopian events and account perks by Weapon. There are entries on the calendar for site events, like Daily Dare, and the more ordinary events, like Half-Price Day. You are able to click on any event and further information is brought up on the side. And don't forget, there is some great information on birthdays and account age perks. This guide is so great because it is very accessible and well-organised. There is not endless blather. Weapon tells us what we need to know. It is your one-stop-shop for information on Neopian events and accounts! The Commander looks forward to witnessing The Expanded Calendar's growth! Good luck with it and any future endeavours Weapon! Incredible sites that are well on their way to being ranked by the Commander. The Hall of Fame honours the closed sites that revolutionized the site-making world forever. 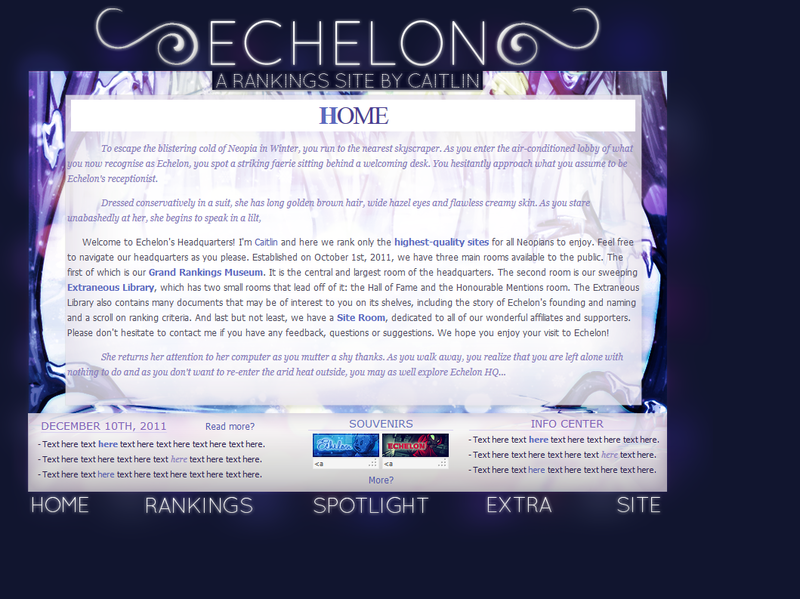 Sites featured by Echelon in the past. The criteria the Commander follows when ranking a site. The story behind the founding and naming of Echelon. A collection of Echelon's achievements to date. A collection of Echelon's fanmail and gifts to date. The many faces - old and current - layouts that have been used by Echelon. Badges that were once used by Echelon. With a little more time, these sites will continue to grow and develop and become more established around Neopia within the site-making community. They will no doubt rise to greatness and become some of the Commander's most trusted establishments. If you've been ranked as an honourable mention, congratulations! It's a true accomplishment. Keep up the great work and in no time you'll be ranked in the Grand Rankings Museum instead. In the meantime, on behalf of all at Echelon, we'd like to bestow you with a medal of honour for your site's accomplishments! These are badges of sites that have now sadly closed. These sites were revolutionary in their field and impacted the site-making community in undefinable ways. These sites deserve to be remembered and revered for all of time. This is a collection of the wonderful sites that have been featured by Echelon in the past. We make it an effort to recognise new or underrated sites first and foremost. Newest spotlighted sites on top. 88x31 Link Back button (absolute requirement). Site must be hosted on a Neopets petpage (absolute requirement). Good syntax, grammar, punctuation and spelling in all written words. A great introduction and sitely/credits section. Attractive, accessible and organized site layout. No stolen content. Updates should be consistent based on site type. Owners should be respectful, with no offensive content or rudeness. Notified inactivity or hiatuses up to 2 months are fine, but no mysterious disappearances. Weaknesses: the Commander will be more lenient with some criteria if site content is remarkable, eg. if you own a button request site and your buttons are out of this world, but your spelling is horrible, then you would still be considered for ranking. In these cases, the site owner would have to be seen making considerable effort to improve their weakness, eg. getting a Grammar/Spelling sweep done by a review or service site. Language barriers: if a site owner's first language isn't English but their site is in English, language errors will be taken into consideration. Unbias: if the Commander dislikes a site/owner but the site-community loves the site, then it'd still be considered for ranking. Owner initiative: Good site owners should constantly be striving to improve their sites, eg. if you've had a review done that points out places to improve upon on your site, then listen to the reviewer's recommendations! Legitimate explanation: if a site has been removed from the rankings for not meeting a requirement but the site owner has a legitimate reason for why the site has been neglected, eg. internet failure, then the site would be considered for re-ranking. Inactive/Closed: as long as the content remains, some sites don't necessarily need to be be updated, eg. a resources site that is inactive or closed. As long as the resources are still up for people to use then the site will still be considered for ranking. Product quality: the product the 'customer' requests must be of high-quality. Request speed: small requests, like buttons and banners, should take at most 1 week to fill. Any longer then 1 week is too long for a requester to wait for a small item. Larger requests, like petpage layouts, should take at most 2 weeks to fill. Any longer then that is too long to keep a requester waiting. Request availability: requests need to be open regularly. There's no use running a site if requests only open every few months. For a site specialising in small graphics, like buttons and banners, requests should open at least once weekly. For more time-consuming request sites, like petpage layout requests, requests should open every 2 weeks. Request chances: there must be a reasonable number of spots available when requests open. For sites completing small requests, like buttons and banners, there should be at least 5 spots on the waiting list. For larger requests, like petpage layouts, there should be at least 3 spots on the waiting list. This is to ensure that requesters have a decent chance of having their request accepted. Customer consideration: the requester's wants must be the biggest priority. They should have a say in the appearance of the graphic they are requesting and be able to request changes to be made if necessary. Review quality: the review the 'customer' requests must be of high-quality. This includes being unbiased and thorough according to the selected rubric. Rubric variety: There should be a reasonable variety (at least 3) rubrics available for a requester to choose from. This is to ensure that you are meeting the specific wants and needs of the requester. Request speed: requesters at the bottom of the waiting list should wait at most 2 weeks for their review. Any longer then that and the reviewer isn't running their site properly. Request availability: requests need to be open regularly. There's no use running a site if requests only open every few months. Request chances: there must be a reasonable number of spots available every time requests open. At the very least, there should be 3 spots available on the waiting list each time the owner opens requests. This is to ensure that requesters have a decent chance of having their request accepted. Pick-up Organisation: the pick-up area in particular needs to be very organised and should be very accessible. Good spelling, grammar and syntax: good spelling, grammar and syntax is even more vital for review sites, as opposed to something like a resource site. This is because review sites are very much text-based. A requester will not take a review seriously if the spelling and grammar is horrible. Be sure to brush up on your English skills if this is a weakness for you. Owner credentials: the reviewer should have valid credentials and some form of proof that they know what they're talking about eg. they've ran a successful site in the past or they work in real life as an editor. Zero hypocrisy: Requesters won't listen to a reviewer bleating on about layouts, spelling and organisation if the review site itself has a horrible layout, text full of spelling errors and an unorganised sitely section. The reviewer must have already taken their own advice. Content quality: the content the site offers should be of high-quality. Originality: the content the site offers should be original and not just carbon copies of another site(s) content. Originality can be achieved by coming up with new and innovative ideas, and using special colouring and drawing techniques which helps to differentiate one site's content from another's. Range/Variety: there should be a variety of content available. Originality: the content the site offers should be original and not replications of another site(s) content. Originality can be achieved by coming up with new and innovative ideas, and using unique editing techniques. Helpfulness: the content should be helpful and needed by those in the site community. Resources are made to cater to the needs of others and so the content should be useful to another site's organisation and quality of graphics. Organization: directories must be organized and very easy to navigate. Multiple columns and sub-headers will help to achieve this, and an anchored layout is preferable. Regular site maintenance and link sweeps are a must. Categories: if the directory is a general directory, there should be a wide variety of categories. Each category should be organised into sub-headers, eg. the Requests category could be divvied up into button, banner, layout and other requests. System: there should be a system in place so viewers can easily differentiate between regular sites and recommended sites. Few restrictions: there should be few rules and no ridiculous restrictions for listees, unless it's a selective directory, eg. graphic sites only. Popularity: normally site popularity isn't of highest concern, but, in this case, competition sites rely on their number of visitors. You need visitors to produce competitors, so sites should work hard to get word of their site out there, by word-of-mouth, advertisement posts on sites like Always Connected or better yet, by offering something so new and innovative that it draws visitors to the site all on its own. Competitions: depending on the site, few or many types of competitions may be needed. For sites that only have a SOTM, the competition should be close and competitive. Only sites that are quite popular should host several competitions as well as a standard SOTM, eg. BOTM and IOTM, because if there's no one participating then there is no point. System: there should be a system in place to prevent the same sites competing over and over, and a set of comprehensive rules. Regularity: competitions should be restarted quite often to give visitors the opportunity to compete. Generally, most competition sites have a new round of competitions per month. Every two months is acceptable, but no longer than that. Originality: competitions should be unique in their own way as there are many 'cookie-cutter' sites out there, eg. offer a type of competition no other site does, offer special prizes for winners (ensure these prizes follow the Neopet' rules) or run themed SOTM's. These are obvious ideas, but you could even try something else. Give your site the competitive edge. Consistency: the site's layouts should be of a very high-quality always. Self-made: the site's layouts should be most often designed and coded by the site owner themself. Originality: the site's layouts should be unique and interesting, with innovative and eye-grabbing designs. Relevance: bonus marks if the layouts are relevant to the site theme or name in some way. Originality: the site theme should be original and not been done before many times over. Maintenance: the site theme should be maintained throughout the site by a story or in another creative way, eg. in review sites, maintain the theme by naming the rubrics relevant names to the theme (if your site has a theme of the different worlds of Neopia, then name each rubric after different worlds, like 'Moltaran Fire' for a cons-only review). Relevance: bonus marks if the theme is relevant to the site name in some way or other. Once upon a time in a universe far, far away was a world called Neopia. During the Month of Gathering in Year 13, King Altador sent twenty of his most trusted soldiers across the scorching heat of the Lost Desert, through the angry blizzards of Terror Mountain and hurtling through the forest glades of Brightvale and all across Neopia on a top-secret mission to search for the most well-travelled and cultured Neopians to form his new hand-picked recognition team. Once all were found and brought back to Altador, King Altador had to name his new team. To do this, King Altador cast his mind back to his higher learning about the country Greece on Earth. He decided to name his band of heroes ECHELON; a noun meaning a level of worthiness, achievement, or reputation. Leading Echelon is a wise, retired General called The Commander. He is called this because no one knows his real name. The Commander has the final say on all rankings. He, along with the rest of his team, have combed every inch of Neopia and are devoted to acknowledging the revolutionary leaders of the site-making community, by recognising and ranking sites of all different kinds. Echelon works hard to recognise other's achievements, but we also celebrate our own. Site names in bold indicate the site has closed where as names marked with an asterisk (*) mean that that site has since removed their recommendation/rankings feature, but that at the time of removal, our rank was as specified below. Please notify Caitlin if you have recommended or ranked Echelon at your site and you are not on this list. Ranked #1 in Competition/Ranking at DigiHear? This is a collection of the fanmail and gifts Echelon has had the pleasure of receiving. Newest letters and parcels at top left. Drag message or gift to URL bar for full size in most cases. Love Echelon? Why not send some fanmail or a gift to us via Caitlin now? Echelon is constantly striving to improve. We respond to the changing trends in the site-community and work hard to set some. We aim to attract viewers to our site to see the rankings by keeping things fresh and interesting. Because of this, we change layouts regularly. This is the complete collection of layouts that Echelon has used to date. Drag and drop the layout into the URL bar for full size. These are a collection of buttons Echelon used to use and also early versions of buttons we now use. Back to the sitely section. Layout designed and coded by Turnip. Image from Neopets, font from dafont, brushes from deviantArt and textures from swimchick. Echelon and all content © Caitlin. Bullets and "back" signs from Bedazzled. Dividers from The Lunch Box. Ranking idea by Soroptimist Directory. Site name from Name the Stars.